Welcome to another Man Monday! The time has come. October is finally upon us. Lock your doors. Protect the children. 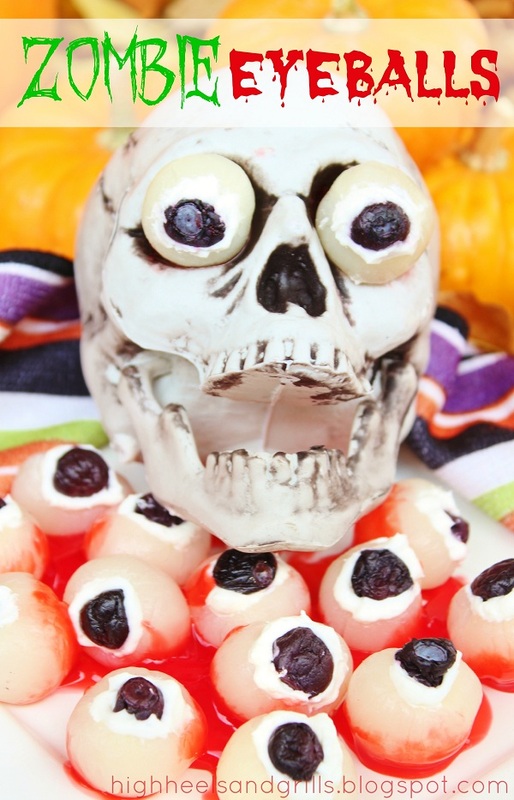 Run for your lives… And eat delicious zombie eyeballs. I fuh’reakin love Halloween. Maybe it’s because I’m a fan of all things geek. One of my most favorite geeky things are zombies. Seriously, ask Sarah. In fact, I can remember a drive we made from San Antonio to Del Rio, Texas (that’s a 3 hour drive, mind you), in which I completely laid out my contingency plan in the event a zombie apocalypse actually happened. I excitedly explained to her my every survival decision while she tried really hard to sound interested. I’m pretty sure eating zombie eyeballs wasn’t a part of that contingency plan, but it sure is fun for Halloween. Sarah will probably post a few cute Halloween recipes, but not me. No sir. Man Mondays will only provide you with the very gruesome. So, without further ado, I present to you this wonderfully morbid and delightful dish. The idea for my zombie eyeballs was found here. Makes about 20 individual and edible oculi (fancy for eyes). Prepare the eyeball filling by simply whipping the ingredients together. It may help to heat up the cream cheese in the microwave for 15 seconds or so… makes it easier to mix. Pat dry the longan fruit and the blueberries. Spoon the filling into a ziploc bag or piping bag. If you are using a ziploc, cut a small section out of a corner. Fill each longan fruit with your eyeball filling by squeazing the filling out of your bag. I like to be very generous with the filling – after all, it’s the tastiest part of your ocular delight. Pack in a blueberry right in the middle. Serve on a plate of blood (strawberry glaze or syrup). If you want to get extra gross… (yes please), add little chunks of strawberry or cherry to mimic bloody pieces of yumness. These look so gross. Ewww! But if you don’t think about eating eyeballs, it would be awesome to totally freak someone out with! These are so funny! They make me want to throw a Halloween party just so I have an excuse to make them! I didn”t know about longan fruit – they look like lychees though, which I fell in love with in China! Gross! My kids would love these. It’s always good to be prepared! I’ve never tried longan fruit, but it sure looks perfect for zombie eyes. I love how you stuck them in the skeleton head! Eyeballs—GROSS!—hehe You did a fantastic job! Love them! These look so cool and creepy!!! I love it!! Thanks for sharing on Foodie Friends Friday! Oh my gosh!! This is flipp’n FANTASTIC!! Even though I am a woman, I am a huge fan of anything ZOMBIE! I am even considering a zombie bed set…..UGH!! I have got to make this of my significant other….He will totally flip out! Oh. My. Goodness. These are freaky-fantastic! Wow!!! These are awesome! What does a longan fruit taste like? Thanks for bringing these to Foodie Friends Friday- you will have to bring them back in a few weeks for “Foodie Friends Freaky Friday Halloween Party”!!! These are disgustingly awesome! Thanks so much for linking up to MTM Mondays! These are disturbing! Good job!!! Love these eyeballs! So much healthier than mine that I made with marshmallows and smarties!! Those are so fun! What an amazing idea! Zombie fanatic right here. So this caught my eye. This is so cool! I’m stopping by from Mom’s Test Meal Mondays. I’m now following via GFC. Hope you have a great evening! Wow these turned out so well! Would love if if you linked up on my blog hop http://www.w-t-fab.com/search/label/bloghop. Also let me know if you’d like to follow each other! I live in Australia and we dont have cool whip here – otherwise I would try it. Can I just use whipped cream? spray can or otherwise?